APPETIZERS: I broke a few glass ceilings early-on when women were just breaking into broadcasting. 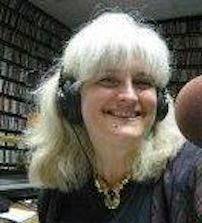 My first several radio jobs after four years in college radio (UC Irvine's KUCI-FM) were as first woman drive-time news anchor and first female news director. ENTREES: VERY PROUD Founding Member of BFCA (Member Emerita). I was there at its birth! My work has taken me through KNAC-FM, Long Beach, KLOS-FM, 93KHJ-AM, KFWB-AM (then all-news), KRTH-101FM in Los Angeles; NBC Radio "The Source," in New York and Burbank CA; the Associated Press Radio Network as West Coast Entertainment Reporter; KTLA-TV "News at 10." SIDE DISHES: HGTV "Smart Solutions" and other guest spots; DIY Network "DIY Crafts"; "LA Parent" column "The Crafty Mom"; band management (Billboard and Mediabase-charting national/international touring indie rockers ACIDIC); Author and illustrator of "The Frazzled Working Woman's Practical Guide to Motherhood," published 1997; blogging on politics and Hollywood, messaging strategy and media analysis. GARNISHES: My work has won multiple Golden Mikes, AP Mark Twain Trophies, honors from the Los Angeles and Valley Press Clubs, a Clarion Award and other citations for public service broadcasting, with documentaries winning Peabody and Armstrong awards. DESSERT: Now retired in the Pacific Northwest, writer and political activist, perennial news junkie, media analyst, environmental activist, Hollywood and pop culture observer.